This being my first child, I’ve been trending toward the more conservative side of everything. Tending to his every whimper in the middle of the night, picking him up and coddling him when he gets fussy on his play mat even though I’m desperately trying to empty the dishwasher, sticking to organics when introducing new foods…you get the drift. So, when it comes to running with him, I’m obsessed with making sure I’m not exposing him to too-cold temperatures. What’s more, with the frigidity of this winter, I’m also concerned with my other running buddy (my “fur baby”) – my 3-year-old Weimaraner – and knowing when the pavement is simply too cold for his little paws. So, what factors should be considered when running with babies (both human and fur) in the elements and what factors should determine if it’s just too cold to lace up those shoes? A combination of advice from fellow momma runners, my own experience over the past several weeks, and some internet searching is what follows. You’re responsible for two people when you’re pushing along that jogging stroller, so even if the temperature feels okay to you and you’re wearing your Yaktrax for additional traction, the conditions are not necessarily safe for your companion. Taking a 12-week old versus a 2-year-old out on a stroller run can make a big difference, mostly because one can tell you how he or she is feeling and one can’t (except through crying, which may be for a number of reasons other than the cold, i.e., teething, a scratchy tag on a hat). While the toddler may just be getting bored, the infant may be getting fussy because his ears are too cold or the wind gusts are hitting her face. The smaller and younger the infant, the more sensitive she will be to the cold and the more conservative you should be. Basically, use common sense here! Luckily a toddler can verbalize how he or she is feeling pretty well. Unfortunately, infants can’t do the same. My little one (8 months and teething like a maniac) likes to tug and eat at the blanket so much so that one time he actually managed to throw it out of the stroller. I then ran right over the blanket and stained it with mud streaks. I’ve found that smaller blankets are easier to keep tucked in around the stroller seat edges to prevent this from happening. I also think layering his clothes is the best bet to keep him warm, even when he manages to kick off the top layer blanket. If your kid is a real kicker, you may even consider a zip-on bunting instead of a blanket. Layers, layers, layers. Think of how you layer up before opening the door to a gusty, wintery run and double it! The baby isn’t moving; he or she is laying still in a stroller. 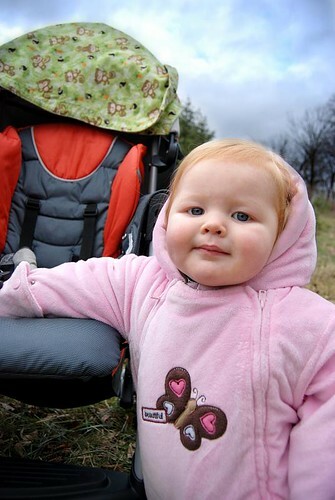 The baby won’t ‘warm up’ once the stroller gets moving but, rather, will get colder the longer you go. I have three levels of body baby suits, depending on the temperature. When it’s approximately 40 degrees, I bundle him in a fleece bear suit. When it’s 35 degrees, I use a thicker, fleece-lined flannel body suit that a friend gave us to borrow. And, when it’s 30 degrees (which is the coldest I will personally take him out in), I use a Burt’s Bees snowsuit that is double-lined with fleece and extra thick. I put his regular clothes underneath these and a blanket on top in addition to gloves and a hat. I continually check on his temperature every mile, touching his cheeks as a gauge. When he falls asleep, I use that as a ‘common sense’ indicator that he’s comfortable. One of my fellow running mamas gave me the tip of slathering on Aquaphor or Vaseline on babies’ cheeks to prevent wind burn. It’s worked like a charm, and I highly suggest you do the same! We have a Citi Mini stroller, which I’ve used on slower, warmer runs and we have a ‘serious business’ Thule Chariot stroller (which once sold at the tune of $1200, but we purchased use from an awesome friend for about $200). The Citi Mini is mobile, lightweight and compact but not actually intended for jogging. It doesn’t have a weather shield or durable tires. The Chariot has a conversion kits allowing for cycling, hiking, and even cross country skiing. It’s really no joke. It has hand-operated breaks, ideal for running, and removable padded seat-bottoms with moisture-wicking mesh fabric. The seat belts are also covered in comfy, padded fleece. The key component is the weather cover which allows easy viewing of the babe and side air vents to adjust the air circulation. It keeps all weather elements out of the question and completely protects the baby. It’s not immune to ice though, despite it’s hefty and expensive tires (which are probably better tires than the ones on my freaking Jeep). I frequent Babycenter’s site as a new momma, and according to them, the best jogging strollers include the BOB Revolution, the Graco FastAction, the Jeep Overland Limited (discontinued), and the Schwinn Turismo. The temperature typically peaks late afternoon, so if your schedule allows, plan to take the babe a little later in the day. Don’t go in the dark, since your safety (hello, black ice patches) will benefit from the warmth of the sun even when it’s cloudy. Having grown up in Lake County, Ohio, smack in the middle of the Snow Belt, I’ve realized 5 inches there versus 5 inches of snow in Columbus mean completely different road conditions. In Cleveland, the road crews are mega prepared and chances of the side streets and neighborhoods being plowed are much greater. Two inches of snow in Columbus turn the towns into complete chaos and road conditions are usually pretty bad. When roads are icy and especially if there is freezing rain, taking the baby for a jog isn’t worth it! When it snows again on top of that ice and there is a crunchy layer of powder, the conditions may seem better but a patch of ice underneath is always possible. I play things conservative and pop in a yoga disc or P90X. Tripping and falling with a baby in tow just isn’t worth a few miles! If you like to run in the freezing weather and snow, your dog should too. The best way to figure out if your dog is well-built for this type of weather? Refer to this list! Dogs with dense coats are going to do the best in cold weather running. Grab yourself a Northern dog breed with furry paws that are good for navigating icy terrain! I have a Weimareiner with short fur and pretty bare paws. He usually limps around the snowy ice after 2 minutes of trying to pee in the yard, so taking him along for a 10-mile run in 20 degree/snowy weather is out of the question. Here are the top 20 best cold-weather dog breeds: Akita, Alaskan Malamute, American Eskimo Dog, Anatolian Sheperd, Bernese Mountain Dog, Chow Chow, German Shepherd, Greater Swiss Mountain Dog, Great Pyrenees, Karakachan Bear Dog, Keeshond, Kuvasz, Newfoundland, Norwegian Elkhound, Saint Bernard, Samoyed, Shiba Inu, Siberian Husky, Tibetan Mastiff, and Tibetan Terrier. Basically, if the dog has “Mountain” or “Bear” in its breed, you’re good to go! Don’t set out for a record long run on the coldest day of the year if you have your dog in tow, no matter the breed. Use common sense and be flexible – it might be a good idea to do a few short out-and-backs instead of one long one too, just in case you need to drop off your pup at home. There is a huge market for doggie coats and doggie boots for winter weather. Is it just a money-making scheme or are they actually practical? Our dog refuses to wear the booties (he thinks they make him look to feminine, according to my husband), but does great with coats. We’ve used the Ruffwear brand, which unfortunately started fraying around the edges a few runs in. We now use a fleece-lined coat that is a little bulkier and seems to regulate his temperature better. Fleece coats do a doggie good! If your dog is thin-coated or you plan to take him on a run where water can splash up and freeze on his fur, a coat should be in the cards, in my opinion. As soon as he comes inside from the run, soak his paws in a bowl of warm water, then dry them completely. Trim the fur growing between the toes to help reduce accumulation of snow and ice on runs. Prevent cracked or bleeding paw pads by putting petroleum jelly or nifty paw wax before taking him on the snowy running trek. So, what are your tricks of the trade for running with babies (human or fur) in the nasties of the winter? Do you have certain temperature when you call it quits? Oh my goodness, your little boy is SO cute! While i am past the stage of worrying about babes in strollers, i did have to figure out what to do with my 9 and 12 year old at their 3k race in Ottawa last weekend. The windchill temperature was -39 C and since -40 is where C and F meet you should have an idea of just how cold that was. Finally realized the answer was ski goggles. By the time they had all their gear on, including the goggles, they had no exposed skin and were toasty warm. I on the other hand did not wear goggles for my 10k race, wow that was cold! PS, my guys looked cute in the goggles, but not as cute as your little one in that outfit!